8 in x 6 in, Rio de Janeiro Collection. Big notes for big ideas. Colorful Post-it® Super Sticky Notes inspired by colorful cities. Note: A minimum quantity of 60 must be ordered, and in units of 1 thereafter. 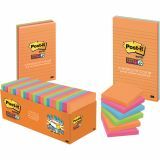 Post-it Notes Super Sticky Super Sticky Meeting Notes in Rio de Janeiro Colors, 8 x 6, 45-Sheet, 4/Pack - Post-it Super Sticky Meeting Notes stick practically anywhere, so you can display your notes and stay on track. Use meeting notes to post, then organize thoughts and ideas on meeting room walls. Great for making meetings more productive. Brightly colored notes stick to almost any surface and don't fall off. Paper used comes from well-managed forests where trees are replanted. Each pad includes 45 sheets. Expressive and dramatic colors celebrate this Brazilian metropolis. 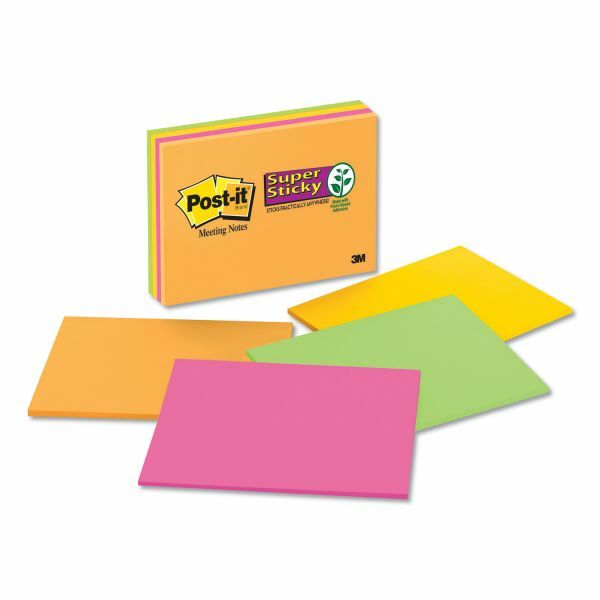 Easily capture, organize and share your Post-it® Super Sticky Notes with the Post-it® Plus App.